Evening view from our room in Villa Laetitia, Ponza. Along with the signature pastel houses of the island, you will find a lot of bamboo shades, white plastered walls and narrow streets designed to minimize the heat. The deep blue sea turns turquoise near the shore. Palmarola, June 2015. Before sunset, people return from their boat trips and the seaside restaurants come alive. Island life on my mind when going through photos of my travel diary. 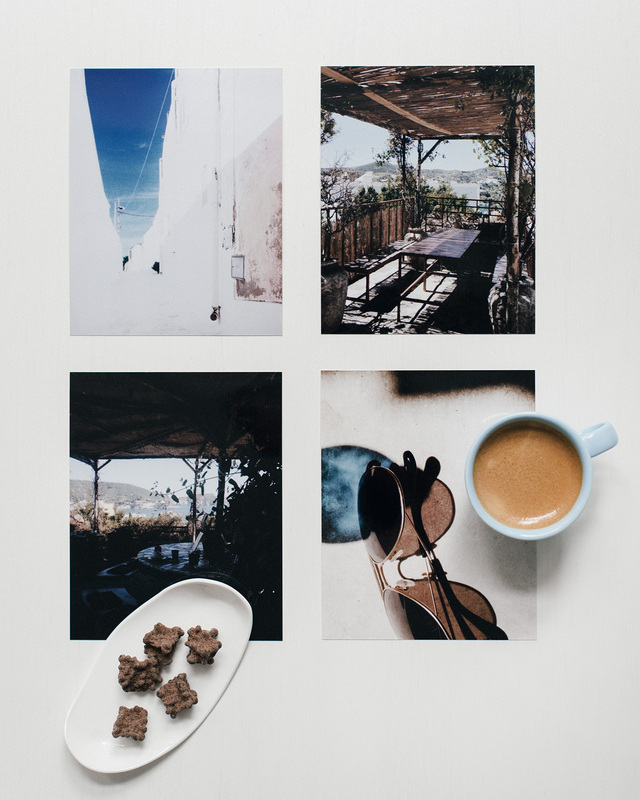 After we finish shooting Saku’s cookbook in Naples, we drive up to Gaeta – a coastal city famous of its olives, and Cy Twombly who lived and painted there – and take a ferry to Ponza. Within the crowd climbing the steep gridiron stairs up to the deck is our brave golden retriever Hilma, who, like us, will soon be exploring Ponza for the first time of her life. 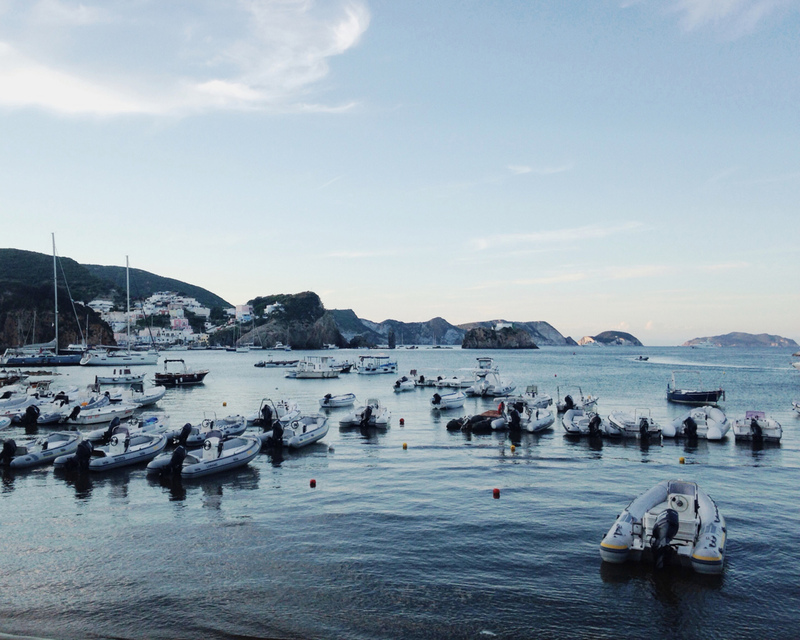 Ponza is favored by Romans for a summer holiday or weekend escape. It is the largest of the Pontine Islands, an island group that consists of six islands located in the Tyrrhenian Sea off the coast of Campania. We settle in a cozy, bohemian B&B, Villa Laetitia, which is baby sister to Villa Laetitia hotel where we often choose to stay when visiting Rome. It is only June but the air is thick and does not move. Hilma is ready for a nap in the room. 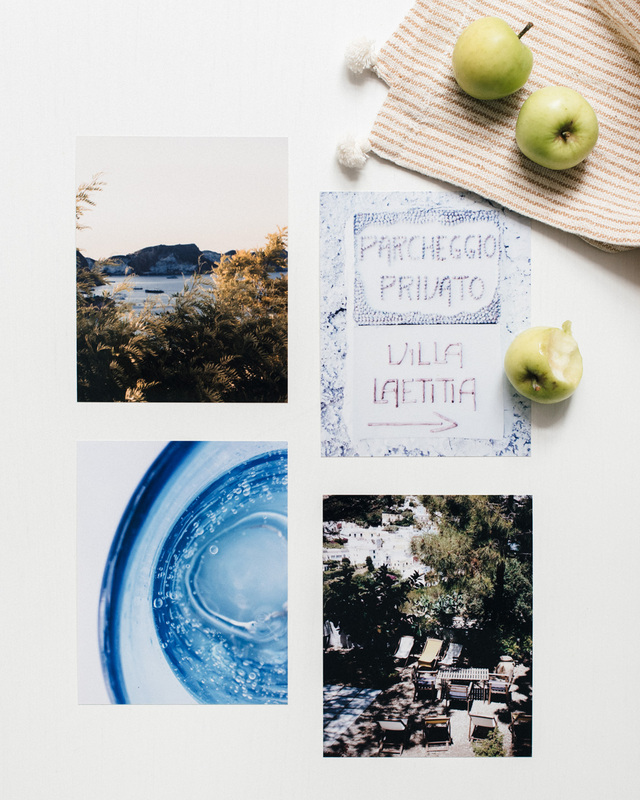 Not sure where to escape the afternoon heat, Saku and I sip ice cold Pellegrino and eat ripe green figs on the outdoor patio of Villa Laetitia before heading towards the waterfront with sea breeze on our minds. 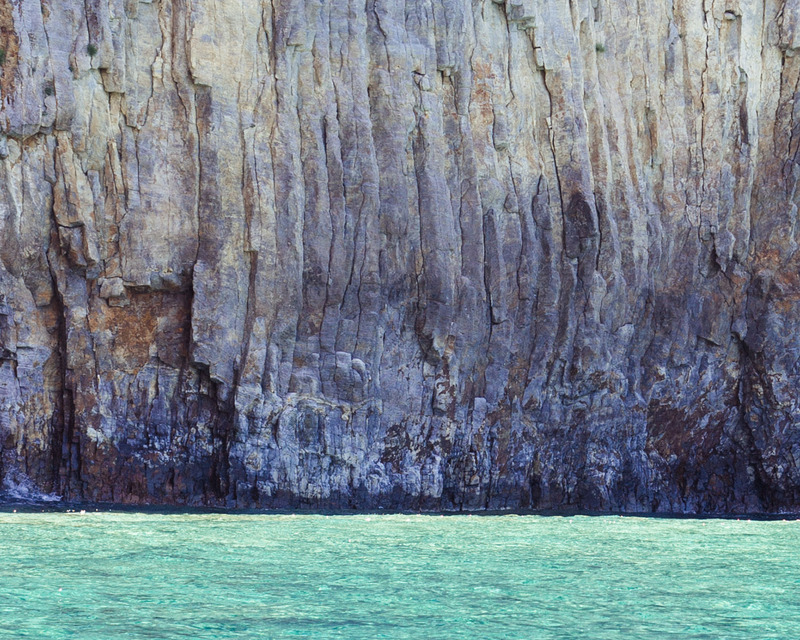 If not quite a party island, Ponza is still lively and loud. Principally everyone is a visitor, but most people come from Rome, and we are the only non-Italians we meet during our stay. A friend has advised us to rent a boat and get off the island, so that is what we do. Sunblock, towels, fresh fruit, water and some money in our beach bag, we are off to Palmarola, a smaller member of the Pontine Islands located some ten kilometers to the west of Ponza. Although practically uninhabited, Palmarola is a popular boating destination. It has a beautiful, rocky coastline with many natural bays that provide safe anchorages. There are cute pebble beaches and coves and caves you can swim into. To access the coast, the easiest thing to do is to anchor the boat and swim to the shore. Because of the rocky bottom, water is crystal clear and turquoise. Only hearing it and watching it makes you cool down. Approaching Palmarola, we discover the joy of jumping off the boat. Swimming and floating in the water, all you see is an endless ocean and, an endless sky. The sky is huge really, you forget this in the city with all the hills and tall buildings blocking your view. And so it is. Vacation. 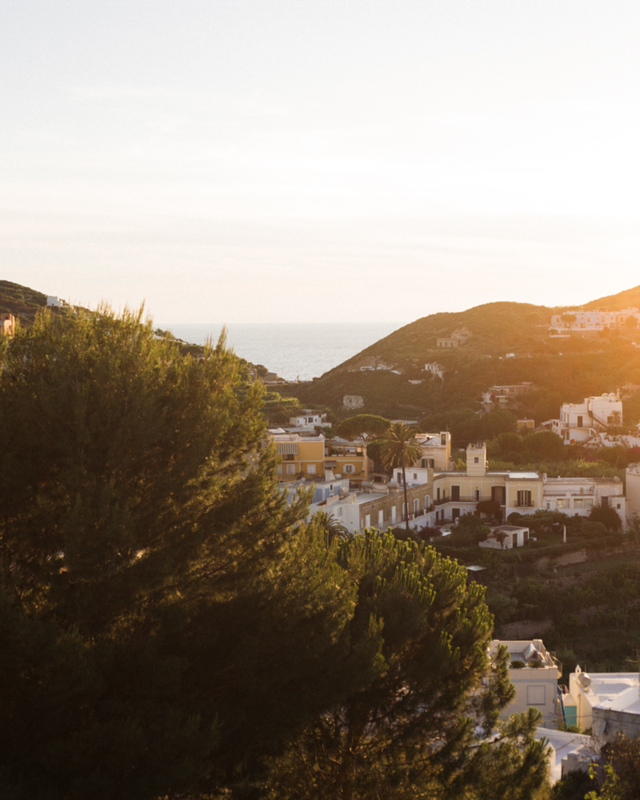 Exploring the world from this perspective will be our number one activity for our Ponza days.